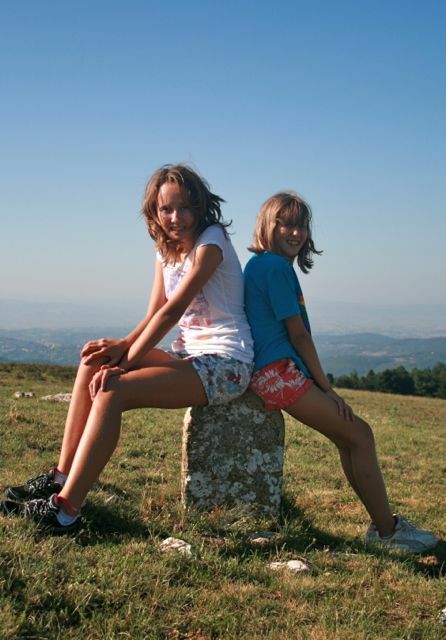 Monte Tezio is a mountain just to the north of Perugia, the top of the mountain is very wide and rounded, once you are at the top it is relatively easy and you can enjoy views from several places. 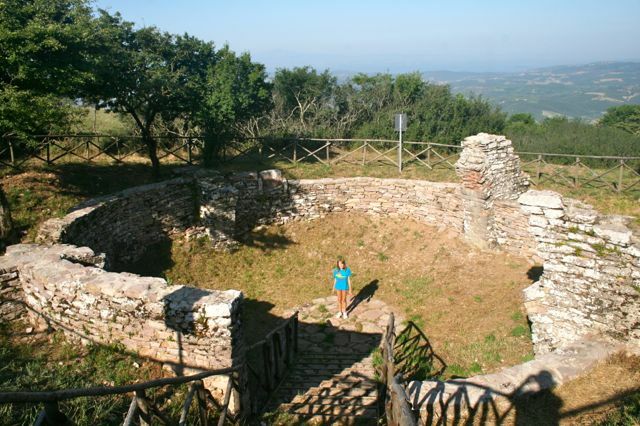 You can find instructions for a hike up Monte Tezio in my walking guide book, Circular Walks On The Tuscany Umbria Border (available as an e-book for the Kindle). 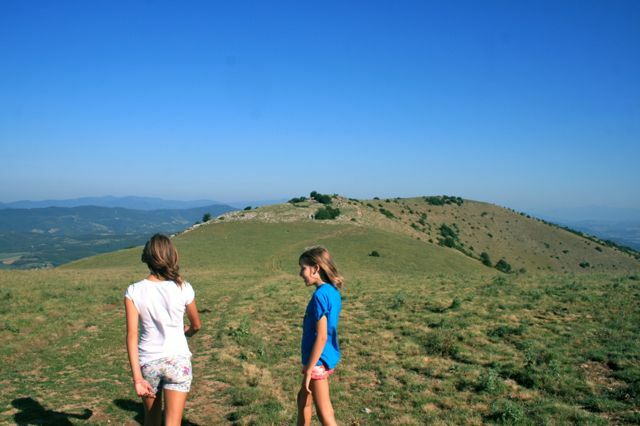 The walk is relatively short but, if you take children, it will take longer (around three hours rather than two). We set off early on a summer morning in July to avoid the heat of the day. The walk involves a hard climb through woods at the start but after about twenty minutes you emerge from the tree line onto the pasture at the top of the mountain. From here the gradient eases off and it’s a relatively short walk to the summit marked with a short stone post. A short distance to the south and, still part of the mountain, is a lower summit known as Monte Tezino, this is made obvious by a cluster of communication antennae. 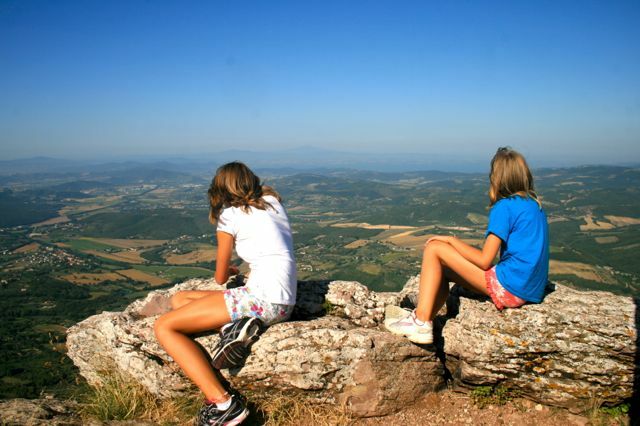 From up on the summit of Monte Tezio there are marvelous views in every direction, you can see Lake Trasimeno to the west, the Apennines to the east and the centre of Perugia to the south. It was going to be a hot day but up here there was still a beautiful cool breeze. The next point of interest on the route is the Nevicata, a circular stone structure that was used to store compacted snow in the winter. Straw was used to insulate the snow and stop it melting, it gradually turned into ice and provided Perugia with a supply well into to summer. The blocks of ice were transported by mules to the city below. The route continues across the top of Monte Tezio to Croce della Pieve, a large iron cross at the northern end of the mountain. Nearby you have to find the route down, a narrow path with a easy gradient that cuts diagonally back along the side of the mountain to the start.